If you want to be a professional speaker, then you are going to need to be able to get people to agree to pay you to come and speak. You know how good of a speaker you are, but they don’t and that’s why they may not be calling you. I’ve had the privilege of attending a number of National Speaker’s Association (NSA) meetings and I was surprised that this is the topic that the professional speakers there spend the most time talking about. The reality of life is that if you want to get booked as a professional speaker you are going to have to submit proposals. A lot of proposals Each of these proposals is going to have a lot of paperwork associated with it and that means that it’s going to end up taking a big chunk of your time. In order to get noticed and invited to apply to speak at an event, you are going to have to write articles for newsletters and magazines, appear on TV, and generally become well known in the circles in which you want to speak. Just deciding to become a professional public speaker does not mean that all of sudden the offers to speak are going to come rolling in. Instead, what is going to happen is that you’ll submit a proposal one month, three months later you’ll be informed that you’ve been selected to speak in four months and then after you are done speaking you’ll end up getting paid a month later. What you are going to have to realize is that it can take several years before you are going to be able to get enough paid speeches that will allow you to generate a decent living. Yes, there are always those stories about professional speakers who go from zero to hero overnight. However, in your case it is much more likely that it’s going to take time before you will be able to develop the momentum that you are going to need in order to turn this into a career. Speaking professionally means that you are going to get people to pay you to come and give a speech. In order to make this happen, you are going to have to determine just exactly how much you are going to be charging for one of your speeches. Something to keep in mind is that that different speeches should have different prices: a keynote is not a general purpose speech is not a training session speech. You are going to need to create multiple fees. The other thing that you are going to have to realize about your speaking fees is that the people who pay for speakers are always going to be trying to talk you down. You are going to have to be careful what you agree to. The world of paid speeches is actually quite small and if you agree to lower your prices for one event, then everyone else is going to find out and will want the same deal. Finally, something that can be a bit too easy to overlook is the fact that a paid professional speech can be a lengthy affair. You are probably not just looking at a single 45 to 60 minute speech. Instead, meeting planners often like to have professional speakers give multiple speeches or run workshops after their speech is over. This allows them to fill their event with speakers and reduces the amount of airfares that they have to pay. A key question that you are going to have to be able to answer is if you have enough material to support a professional speaking career. Your keynotes will probably consist of you delivering a speech with the help of some PowerPoint slides However, if you are running a workshop then that will probably require you to create questions and answers, perhaps a skit, and some role playing opportunities. You are going to have to get creative and make sure that you can fill the time that you’ve been paid to fill. For some of us, not all of us, after we have been speaking for a while we may get bit by the professional speaking bug. What this means is that we are confident in our speaking ability and we’d like to venture out and find out if people who understand the benefits of public speaking would be willing to pay us to come and talk to their organization. While this might represent a great opportunity, we need to make sure that we have the answers to some questions before we do this. The first thing that we need to make sure that we can do is to get booked to deliver paid speeches. This is going to involve filling out lots and lots of forms. We also have to understand that the time line for giving speeches may be stretched out and not line up with how we’d like things to be going. When you offer to give a professional speech you are going to have to know what your speaking fee is. Be careful because the people who book speakers will be trying to talk you down to a lower fee. The speeches that you’ll be booked to give will turn out to be long speeches and you may be asked to give multiple speeches at one event. Make sure that you have enough content to pull this off! The good news is that there are a lot of people out there who do make a living as a professional speaker. However, this is not an easy path to take. You will be running a business and you will have a single product that you are trying to sell – yourself! 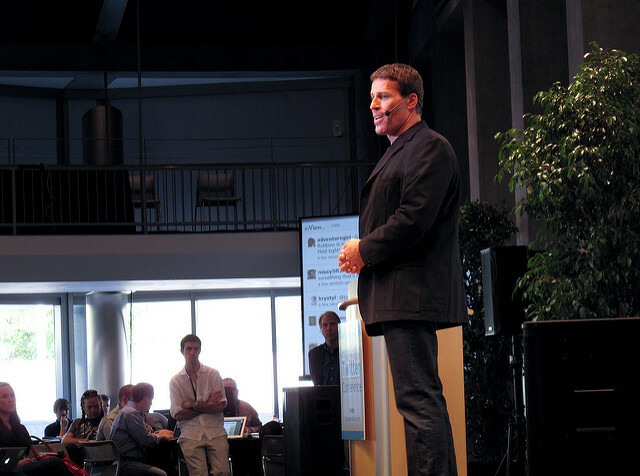 Keep what we’ve discussed in mind and who knows, you could find yourself sharing the stage with Tony Robbins! Question For You: If you became a professional speaker, do you think that you should focus on one topic to speak about or have multiple topics?